Doyle Brunson, who is also known by his nickname "Texas Dolly", was born on August 10, 1933 in Longworth, Fisher County, Texas. He is an icon when it comes to the game of poker and perhaps the greatest poker player of all times. Brunson was the first to win two World Series of Poker (WSOP) main event titles consecutively and to date he holds 10 WSOP bracelets (tied at second place with Johnny Chan) and 1 WPT bracelet. All this and much more gave him the honor of being inducted into the Poker Hall of Fame. Brunson was also awarded in 2006 by Bluff Magazine the title of the player that had the most influence on the world of poker. Erick Lindgren was born on August 11, 1976 in Burney, California. He holds one World Series of Poker (WSOP) bracelet and two World Poker Tour (WPT) titles. He is also known by his nickname "E-Dog" and his hometown is Las Vegas, Nevada. He is a great poker player and it appears that he knew what he was doing when he decided to become a professional player. He had only one steady job in his life and that was as a blackjack dealer when he was 19 years old. After blackjack came poker and the success. When he was 19 years old, Deeb immigrated to the States from Lebanon. He was studying at Utah State University when the civil war broke out in 1975 in Lebanon and lost touch with his mother and father for two years. Because of this, he could not receive their financial support while he was at school. Gustav Hansen, who is better yet known as Gus Hansen, was born on February 13, 1974 outside of Copenhagen, Denmark. He is also known as "The Great Dane" and he currently resides in Monaco. 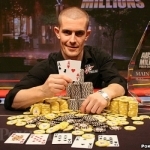 Hansen holds a record of winning three World Poker Tour (WPT) championships. He has also won the Aussie Millions in 2007 main event and was the winner of the PokerStars Invitational Tournament in its first season. Before becoming a successful and professional poker player in 1997, Hansen was a world-class backgammon player and also a youth tennis champion. Howard Lederer was born on October 30, 1964 in Concord, New Hampshire. He holds 2 World Series of Poker (WSOP) bracelets and 2 World Poker Tour (WPT) titles. He is known by his nickname "The Professor", he is the brother of professional poker player Annie Duke, and his hometown is Las Vegas, Nevada. When he was young, Lederer was playing chess and was quite good at it. He was actually considered as a talent. And so, after finishing high school, he decided to move to New York City and attend Columbia University. It was in one of the chess clubs that he was discovered to the game of poker and from there on he started playing at the Mayfair Club. Jamie Gold (born Jamie M. Usher) was born on August 25, 1969 in Kansas City, Missouri. Besides being a poker player, he is also a television producer and a talent agent in Malibu, California. He is most known for his win of the 2006 World Series of Poker (WSOP) Main Event, where he took home $12,000,000. Today, since he also works as a producer for "Buzznation", he divides his time between work and playing poker, especially in major tournaments. When he was young, Gold moved to Manhattan with his mother, who remarried to Dr. Robert Gold. It was then when Gold's last name (Usher) was changed by a court order to Gold. Jeffrey Lisandro who is also known by his nickname â€œIcemanâ€ was born in Perth, Australia and heâ€™s an Australian professional poker player. He currently lives in Salerno, Italy but also has a property in Santa Barbara, California. Lisandro was taught the game of poker by his mother when he was only five years old and today he is known as a specialist when it comes to cash games, but he is no stranger to tournaments and live poker events, as he is also considered to be one of the best Seven Card Stud poker players in the world. Jennifer Harman-Traniello (born Jennifer C. Harman) was born on November 29, 1964 in Reno, Nevada. She started playing poker when she was only 8 years old. She later attended and graduated from the University of Nevada. Harman is the only woman to hold 2 World Series of Poker (WSOP) bracelets. She won her first bracelet in the year 2000 at the $5,000 No Limit Deuce to Seven Lowball event and her second bracelet in the year 2002 at the $5,000 Limit Hold'em event. The most interesting part is that Harman had never played Deuce to Seven Lowball before and coming to the tournament in the year 2000 was her first time playing this game. Jerry Yang (born Xao Yang) was born in the 1968 in Laos and his hometown today is Temecula, California. He holds one World Series of Poker (WSOP) bracelet and is known for his win at the 2007 WSOP Main Event where he won his bracelet and $8,250,000 in cash. He began playing poker in 2005 and was only an amateur. After he won a $225 satellite at the Pechanga Resort and Casino in Temecula, he was able to enter the 2007 WSOP Main Event, which he eventually won becoming well known to the entire world.